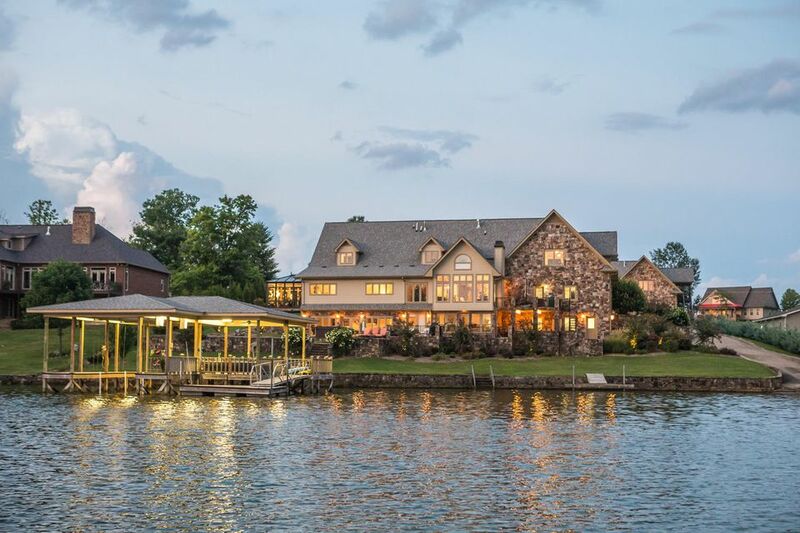 This luxury Ooltewah home on the water will take your breath away! Come see the tall glass windows with panoramic views, expansive decks, a large great room, billiards room, movie room, bonus room, wine cellar, private office, conservatory, 3 garages with room for 8 vehicles, sun room with a view, a bar on every floor, separate guest house, boat ramp, and a covered dock set against sweeping views of the lake and wooded hills. This home has been fully renovated and is seated on a large, gated estate lot. The custom kitchen is a chef's dream with specialty granite, gourmet appliances, and rich cabinetry overlooking the lake. The master suite on the main level is steps away from the private conservatory and sunroom, and has a large custom closet room, separate walk-in closet, and spacious master bath with a jetted tub and walk-in shower. Upstairs is accessible from the exterior of the home, with 3 large bedrooms, 2 full baths, and a massive bonus room. Downstairs, the fully finished basement offers killer views of the sunset while you play billiards or work from your large, private office. Next to this is the large movie room, another full size kitchen, and wine cellar. The home has so much storage space, with closets and storage nooks everywhere you turn. The entire home is wired for the tech enthusiast: a Crestron A\V system with touch screen control panels and surround sound is connected to a playback server and pre-wired throughout the home, dual light switches and garage door controls on opposite sides of the room, ethernet jacks are installed throughout, all incandescent lighting is on dimmer controls, the entire property is on irrigation from well water, ice maker on main and basement levels, and the entire home is on a back-up generator. The large covered boat dock with boat lift has a 10,000 lb capacity, allowing year round boat storage. The separate gate house is fully decked out with a custom kitchen, living room, master suite, and 2 car garage. This can create over $30K per year in vacation-by-owner income. © 2019 Chattanooga Multiple Listing Service. All rights reserved. The data relating to real estate for sale on this web site comes in part from the Internet Data Exchange Program of CHTMLS. Real estate listings held by IDX Brokerage firms other than Re/Max Renaissance Realtors are marked with the Internet Data Exchange logo or the Internet Data Exchange thumbnail logo and detailed information about them includes the names of the listing brokers. Information provided is for consumers' personal, non-commercial use and may not be used for any purpose other than to identify prospective properties the viewer may be interested in purchasing. Re/Max Renaissance Realtors does not display the entire MLS of Chattanooga, Inc. database on this website. The listings of some real estate brokerage firms have been excluded. Information provided is deemed reliable, but not guaranteed. Data last updated: Thursday, April 18th, 2019 at 07:59:05 AM. Listing courtesy of Keller Williams Realty.